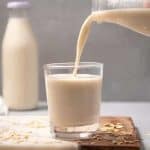 This creamy homemade oat milk recipe is so easy and quick to make and tastes delicious too! It’s ready in 5 minutes and only 5 ingredients are needed. Add the oats, water, dates, vanilla and salt to a high-speed blender and blend for 15-30 seconds until smooth. Strain through a nut milk bag or a cheesecloth. The leftover pulp can be used in smoothies to add extra fiber. Pour into a milk bottle and allow to chill for at least 2 hours before drinking. See notes in the post above about how to reduce slimy oat milk!